There may be instances when you need to return a rental car after the branch office is closed--perhaps you have an early flight or were delayed in traffic. You park and lock the car and put the keys in a secure drop box, with the understanding that the rental car staff will check in the car the next morning. Confirm the rules. Make sure the rental company allows returns outside of business hours. This can differ for a company between airport and non-airport branches and even between different non-airport branches. Notably, Enterprise, Alamo and Dollar/Thrifty usually don't allow after-hours returns at non-airport locations. Prepare for drop off: Is there a key or PIN for the drop-off box or another mechanism of return? If you aren't sure, call the company and clarify. Secure the car: Park the car near a light if possible and in view of security cameras. This will discourage people from stealing the vehicle and if the car is stolen, video footage may help prove that you are not at fault. Gather evidence: Take photos or a 360-degree video of your car to document its condition when you drop it off, including the fuel gauge and odometer. We recommend using Record360. Even though the rental agreement clearly states that you are responsible for the vehicle during the interim between dropping off the car and check-in, it can't hurt to have proof if you have to dispute a claim. Also, take a photo of your completed contract and any ancillary forms in case they go missing. Leave the keys in the drop box. Wait. Keep a lookout for confirmation from the rental company that they've checked-in your rental. The company should email you within two days of returning the car. Trust but verify. If you don't receive confirmation from the rental branch that they've checked-in the vehicle, call the branch directly. Sustained Liability: Most rental agreements state that you, the renter, is responsible for the car until the company checks it in. That means that any damages that happen overnight (hail storm, theft, break in) will be on you and you'll be charged. If the car is stolen, you'll face possible damage charges or an insurance claim. Lack of Representation: When you return during normal hours, any unresolved issues such as small, apparent damages or gas/mileage issues can be dealt with in person. If you return your car after hours, a company agent deals with any issues alone--and they're not afraid to tack on additional charges. Late Fees and Extra Charges: If you're returning the car after hours on your last rental day, know that most rental companies will consider your rental late and will tack on an extra day. Contact your rental company as soon as you realize you'll be returning your rental late to try to avoid additional charges. Or better yet, think ahead and consider adding on an extra day when you book. Can You Return After Hours? Most large airport locations stay open 24 hours a day, but rental counters may close at night at mid-size and smaller airports. In general, Enterprise tends to have shorter hours than other major companies, as do the smaller discount companies such as Advantage, E-Z, Fox and Payless. 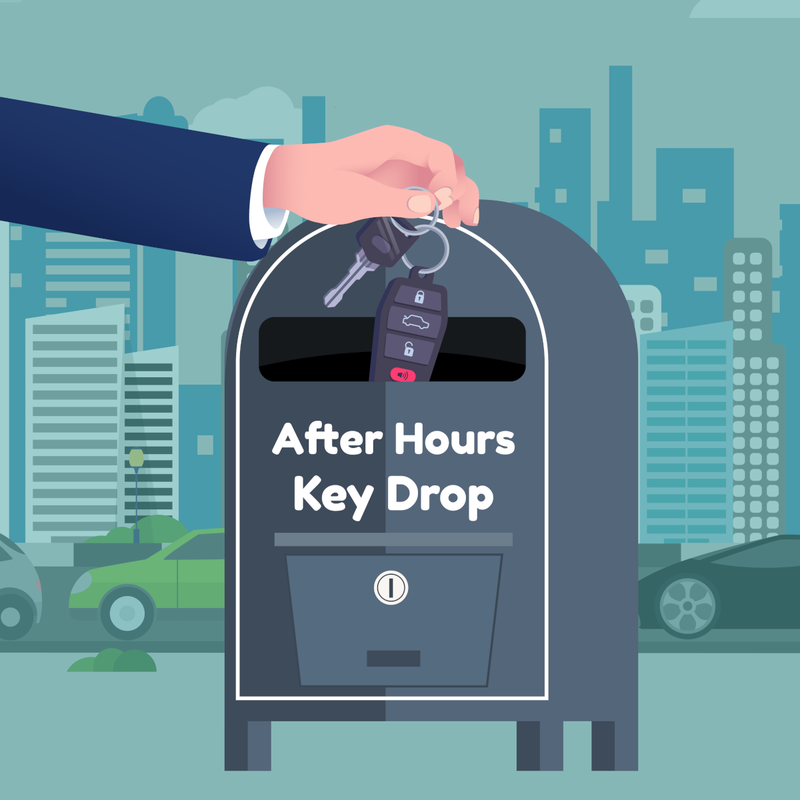 Most rental companies at airport locations have a key drop box near the return area to handle after-hours returns or unmanned return areas at slower times. Off of the airport, Enterprise has by far the largest number of suburban and small-town locations of any rental agency, so the other companies generally match Enterprise's hours. Enterprise hours vary slightly by region, but the hours at a typical Enterprise off-airport branch are 8 AM to 6 PM Monday through Friday, 9 AM to noon on Saturday, and closed on Sunday. Other rental car companies typically hold similar hours. In general, suburban and small-town rental car offices are happy to accept after-hours returns. This isn't always the case, however. It varies by region, company and individual location. Locations with locked parking lots and in higher-crime areas might not offer after-hours drops, but that's not the only time—member of the AutoSlash team was dumbfounded to discover that no rental company in Ventura County, California, a relatively high-income region, allowed after-hours returns. In larger urban areas, some off-airport branches may have extended hours. For example, in New York City, some branches in Manhattan are even open 24/7. Due to limited parking in denser areas, after-hours returns may not be possible, so be sure to check. If possible, try to return a rental car when the office is open. If you must leave the car after hours, be sure to check the company's policies and follow the best practices we've outlined to keep the car safe until it can be checked in.